Vinyl album: AMLH 68078 (A&M, UK, Feb 1972). Triplefold sleeve (one of if not the first!) with lavish booklet, both designed by Paper Tiger - arguably (IMHO) one of the best packaged albums ever! Inner spread is huge depiction of the wanderer in silver on background of rainbow colours. Front cover features William Blake painting "Glad Day" and classic logo, the other faces of the "triptych" feature quotations from "Hymn of Praise to Ra" and The Buddha. The 16 page booklet is BEAUTIFULLY produced in brown print on cream paper throughout. Each track has its own lyric page with intricate engraved illustrations and page decorations/borders and the inside back page photos of each of the band members. Initially issued with brown A&M label, later re-issued with silver label and updated office address (New Kings Road rather than St. George Street). To see the wanderer the right way up, click on the image below. Slight differences in layout; publishing details have been re-aligned. On side 1, the variant has tracks 5 & 6 below the A&M logo and the album title is rather off-centre. The album title and band name aren't in bold, nor is the catalogue number and "STEREO". Not certain which came first, but I'd guess that this one, the untidier layout, was first and then corrected when the album was repressed. I acquired this from someone a while back. Autographs not secured at the time of release (note that DC dated the signature), though the copy is a first release UK copy. Vinyl album: SP 4344 (A&M, US, 1972) Whilst the US sleeve was simpler, only a gatefold sleeve rather than the triple sleeve of the UK version. The US sleeve had the normal front (except with a little A&M logo bottom right and the US catalogue number), and the "THOU HAST HEARD WITH THINE EARS AND THOU HAST SEEN WITH THINE EYES" panel on the back, but the decorative border in red. In the centre, the "wanderer" picture is reduced down to fit over the two panels of the gatefold. The booklet was identical apart from the US address on the back cover and US publishing details on page 14. Vinyl album: SP 4344 (A&M, US, 1972). Same as US promo above. Nice A&M company inner sleeves associated with these releases. Ni idea which order they came in. Vinyl album: SP 4344 (A&M, Canada, 1972). The Canadian promo sleeve is gatefold as per US release. The Canadian adress on the back cover is "255 Yorkland Boulevard, Willowdale, Ont." No booklet in the copy I have, but the record came in a "Listen To Your World" A&M company b/w inner sleeve. It's taken two Ebay purchases to get this right. The first copy has a scribbled message on it: "Monic - call me!" If someone had done that to one of my records I know what I'd have called them. If Monic sees this - let us know what happened! The second turned out to be a mispress with two labels the same - fortunately they were both side 1! Vinyl album: SP 4344 (A&M, Canada, 1972). . Gatefold sleeve, same as US release, but the front flap is not hollow, looks as though paper inner featuring "the wanderer" has been pasted over the inside and only the right hand side can hold the LP and the booklet. Back cover has Canadian A&M address "255 Yorkland Blvd., Willowdale, Ont.". Brown labels, same "spiky" typography as used on early silver label releases. Copy I have came with a light blue A&M company inner, which bears different address - "120 Milner Avenue, Agincourt Ontario" - so may not be the sleeve it came in. Booklet has US address "PO Box 782, Beverly Hills, California 90213" and was printed in USA. It could well be that US and Canada co-operated on printing the expensive booklet. Vinyl album: SP 4344 (A&M, Canada, ??). Gatefold sleeve pretty much identical to the US release, except for Canadian A&M information printed in different type on the back cover. There are two variant sleeves, one with the address centred under the cover/booklet credits, one bottom left. Not known which is the earlier. The booklet has the US A&M address on the back page. Labels are same as promo release above and brown label release aboveand also same blocky style silver labels used for eg Early Strawbs, so I think this is a reissue from between 1973 and 1974. The copy I have came with a nice A&M protective sleeve (made in England!) which fans could write away for to protect their record collections. Vinyl album: SP 4344 (A&M, Canada, ??). Single sleeve, silver label. No booklet in my copy. Label style similar to Classic Strawbs and Best of Strawbs so I'd guess 1977 or later. Vinyl album: SP69921 (A&M, Canada, ???). A&M white label budget reissue. Single sleeve, with the Hymn to Ra on the back, Front cover has SP -4344 under A&M logo at bottom right. No booklet. Vinyl album: SP69921 (A&M, Canada, ???). Reissued on white A&M budget price labels, same typography as silver label reissue above. Single sleeve, with the Hymn to Ra on the back, and "Previously released as SP 4344". No booklet. There's a price code "D" logo top right (others I've seen are "G", so this is most likely a budget reissue. May also have been reissued on black budget price labels. Vinyl album: (Sonet SLPS 1534, Denmark, 1972). Identical apart from label on LP to UK release - UK addresses on booklet, sleeve. Vinyl album: SLAM 68078 (A&M, Italy, 1972). Three panel sleeve, identical to UK release, except that Italian cat number and distributor details are on the back. The booklet as per the UK release, except without an address between the two "blowing cherubs" on the back page. nice company inner sleeve. Vinyl album: (A&M, Israel, 1972) - Slightly tatty release from Israel - front cover similar to UK, but back cover a bit scrappy. Vinyl album: SP. 4344 (A&M/The Gramophone Company of India 1972). This is a cheap and cheerful sngle sleeve release. The front copies the US release. The back cover is plain white with the Hymn of Ra in black, scant design credits for front cover and liner illustrations, booklet design (the copy I have has no "liner" or booklet). Details at the bottom for The Gramophone Company of India Limited, Eagle Litho printing credit bottom right. Vinyl album: LPS-77995 (A&M/Palacio di la Musica, 197?). Modelled on the US release, gatefold, with the wanderer on the inside and the Hymn to Ra on the back cover. Also on the back cover bottom left, a box reading "DISCO ES CULTURA" and distribution info under the A&M US address: "Fabricado y Distribuido por el Palacio di la Musica S.A, Apartado 1637, Caracas". On the front cover, the Venezuelan catalogue number has been printed (badly) above the A&M logo, bottom right and at bottom left there's a boxed "STEREO COMPATIBLE". Silver labels, but the previous record in numbering sequence (77994) was Carpenters: A Song For You also released in 1972, so either Venezuela got silver labels earlier than the UK and other places, or these were later releases, possibly 1973 or 1974. Vinyl album: SAML 934522 (labels are SAML 934,522) (A&M (Festival), Australia, 1972) - The Australian release was a single, high gloss sleeve - the front was the same as all the others, the back had the "THOU HAST HEARD WITH THINE EARS AND THOU HAST SEEN WITH THINE EYES" panel and a small typed track listing. Inside however was a four page booklet, with the band pictures on the front and credits on the back. In the centre, typed lyrics with selected graphics from the UK booklet. See also NZ release below which seems to have had the same sleeve and insert. Vinyl album: SAML 934522 (A&M 1972). The New Zealand release is on brown labels, manufactured in NZ. However it seems to come in an Australian pressed outer single sleeve, with the same insert as the Australian release - perhaps both parts of Festival shared those costs. See Australian release above for sleeve and insert. Vinyl album: AMLH 68078 (A&M/?? ?, 1972). The South African release is modelled on the US release, with similar gatefold not tri-fold cover. 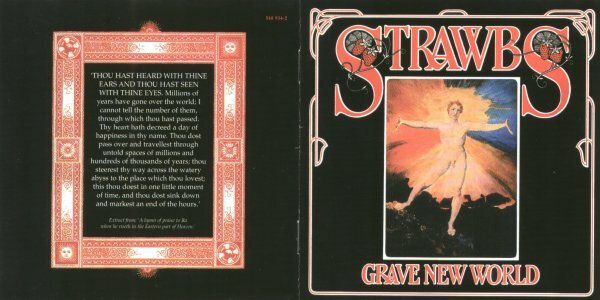 Th finish is matt on the black parts of the front cover but a little shinier on the William Blake painting and the Strawbs logo. Back cover is changed to give track list and credits (the reissue below had a 2 sided black and white insert - see below: highly likely that the original release would have had one as well, but my copy doesn't). Interpak printing credit bottom right. Both brown and silver labels mis-credit "Heavy Disguise" to John Ford and David Cousins rather than just John Ford. The back cover is correct. Vinyl album: AMLH 68078 (A&M/?? ?, 1972). As for the original except with silver labels, and the whole outer cover is laminated. Inside there is a 2-sided LP sized black and white insert on stiffwhite card with credits and lyrics, framed by some of the booklet corner graphics (but no other pictures). Tiny print credit to Interpak back, bottom right. Vinyl album: AML 141 (A&M (King Records), Japan, 1972) Discogs lists a copy which refers to a promo stamp on the label. So it may be (unusually) that this did not have a promo release - anyone got one? Vinyl album: AML 141 (A&M (King Records), Japan, 1972) - The Japanese release is the full triple-fold cover, with the Japanese catalogue number added to the front cover at top right above the second "S" in Strawbs. The booklet is on slightly thicker, textured cream paper, but the printing is in black rather than the brown used for the UK booklet. The first few pages have credits and a piece in Japanese on Strawbs. The lyrics appear in both English and Japanese. The obi overlaps itself on the back and see the text underneath you have to lift the flap. Cassette: ZCAM 68078 (A&M, 1972). Standard Precision tapes release. Unusually Precision haven't messed around with the running order. Cassette: CAM 68078 (A&M, 1973 or later). A&M UK took over producing their own cassettes from 1973 onwards. Very likely to have been a US cassette release - anyone got one? Very likely to have been a Canadian cassette release - anyone got one? cassette: EM-K78078 (A&M, Italy) Spotted online. The track listing follows the vinyl album. Scans to come. 8-track: Y8AM 68078 (A&M, UK). As with cassette releases Precision Tapes, who produced tape products for A&M in those days, tracks were re-ordered. With 8-tracks, apparently, there was an audible changover between each set of 2 tracks, so the running order was revised as follows, even splitting some tracks in two. This once, they kept things mostly the same as the LP running order, only shifting one of the short "Hey Little Man" tracks. 8-track: YAM 68078 (A&M, UK, 1973). A&M took over manufacturing cassettes and 8-tracks in 1973. Listed in 1973 catalogue. cassette: EM-S 88078 (A&M, Italy) Spotted online. As with the Italian cassette above, the running order follows the vinyl. Shocking orange plastic cartridge! CD: D32Y3578 (A&M Japan/Canyon Records, 1989). Front of booklet is as per UK release (no logos). The back of the booklet is the "Hymn of Praise to Ra" which appears on the back of the UK album, scaled up to CD size (UK credits for booklet design and William Blake picture credit at bottom). Inside the booklet is a 2 page spread of "the wanderer", with the Buddha quote at the bottom. The tray back has the UK back panel decorative border, but with a track listing inside rather than a quote. Two inserts: the first (a 2-side 4x2 CD sized insert, folded to make a 4pp booklet then folded again to fit in the CD case) has a biog in Japanese (dated March 1989) with the lyrics in English, as set out in the vinyl album, and also in Japanese (see pages 3 & 4). The second is a 2-sided 2x2 CD black and white promotional insert with other releases in the "A&M CD Super Seclection 2000". CD: SRMC 0075 (Si-Wan, 1997). Outer booklet nearly matches UK "tryptych" LP release but with a bigger A&M logo and Si-Wan cat number. Inner EXACTLY matches the original UK three panel gatefold sleeve in miniature. Tray back resembles UK version, with decorated border, but instead of a quotation it has the track listing and Si-Wan dragon logo and cat number. pp16-19 - a 3-page biog in Korean and, a selection of photos from the same period as those included in the original. CD: 540 934-2 (A&M, 1998, REMASTERED WITH 2 BONUS TRACKS) Covers booklet match front cover and "Ra" quote, inner spread reproduces the wanderer. No lyrics, but six pages of new sleeve notes by Dave Cousins and John Tobler. CD: MRCD 005 (Unknown, mo date) with 2 bonus tracks) Reported as an "unofficial" release, based on the Universal remaster. Single sheet inner, with a few typographic errors ("S. Cousins" and "Tony Viconti". Morgan Studios referred to as "Modern Studios". CD: UICY-78837 (Universal, Japan, 2018) Beautiful facsimile reissue - the first trifold CD replica - including original booklet and Japanese booklet, based firmly on UK vinyl release. Obi mimics original Japanese release.